Since 2010, there has been an incredible explosion of food banking in the UK. 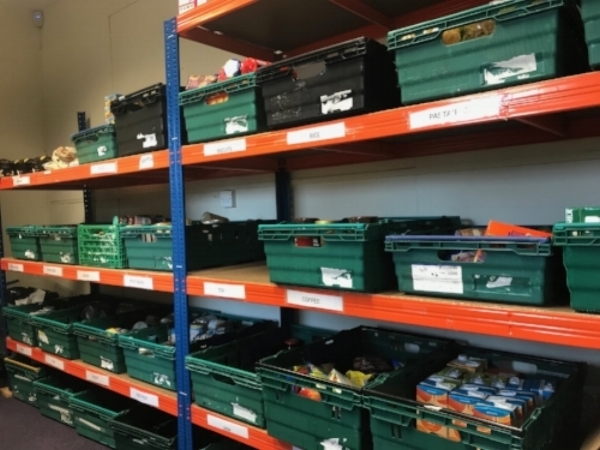 While structural economic issues including stagnating wages and unstable employment have increased food poverty, the rise of food banks has been in large measure a response to need generated by the Tory government’s (Conservative Party) austerity initiatives. Welfare program reforms and punitive sanctions (in which welfare recipients are kicked off benefits for months at a time for not meeting cumbersome program requirements) have been key factors in driving up food insecurity and forcing people into food banks. (One nomenclature thing—UK food banks are roughly equivalent to US food pantries. They don’t have the large warehouse food banks as we do in the States with some exceptions as will be described below). The Conservative government has streamlined multiple welfare programs (such as unemployment insurance, housing assistance, and old age pensions) into a single program, called universal credits (UC). While UC was intended to address some legitimate issues, its roll out in parts of Britain has been enormously problematic, as beneficiaries are made to wait at least five weeks- and sometimes two or three months – to receive their checks, with no retroactive pay. As a result, there is great fear that landlords will evict many tenants this winter, causing a surge of homelessness. In addition, the housing portion of UC payments will now be made directly to recipients rather than to landlords, with many concerned that doing so will lead to increased homelessness, as recipients prioritize other expenditures over housing. The conservative media for its part tends to call out food banks as enabling the “undeserving poor”, those it calls the scroungers and skivvers (freeloaders), to avoid a hard day’s work. · Recipients must get a voucher from a health care provider, social service agency or other similar entity attesting to their need for surplus food. They can only get three vouchers in a six-month period (although Trussell Trust staff have said that as long as there is food available they will not turn anyone away, especially given the dramatic rise in demand). Each voucher is good for a three-day supply of food, based on the household size. The purpose of this voucher is to verify the individual’s need, ensure that they do not become dependent on the food banking system, and to some degree assure donors that their clients are not freeloaders. · Individuals coming into food banks often chat with volunteers about their needs, and get directed to other services that can help address the broader issues in their lives. Social service agencies will in some cases be in attendance to help direct clients to other services. · Clients have limited choice over what they receive. Volunteers who run the food banks will often honor requests based on dietary preferences/ needs. 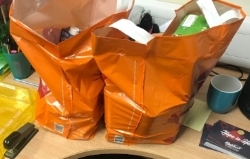 Clients receive pre-sorted bags of food, grounded in rough nutrition standards. There are variations of the standard food parcel, for homeless persons or for those who can only heat up water but don’t have stoves. Cans of baked beans seem to be the dominant item. The food package I viewed has a fair amount of cookies and other sweets in them, which volunteers perceive to be nice treats. · The food is donated by community members, and tends to be all pre-packaged or canned. Most food banks do not have refrigeration or the ability to handle perishables. Major supermarkets have bins in which shoppers can place their purchases on an on-going basis. Trussell has agreements with major supermarkets such as Tesco and Sainsbury to run campaigns once a year in which the stores will write a check for 20% of the value of the food collected. Clearly, these food drives are an inefficient way of raising food, given that donors are paying retail prices. But, they do create a framework in which donations are directed to local need. About one third of the food banks are outside of the TT network, some of which are linked together through the Independent Food Aid Network. Each food bank operates differently. Most require vouchers. Some do not, preferring to serve all persons and not creating further hoops for families in crisis to jump through. Some are tied to specific religions, as with Muslim foodbanks in the heavily immigrant town of Bradford in the northern part of England (Maddy Powers of York University documented that Muslim participation in food banks has been quite limited due to strong familial ties and the powerful stigma associated with patronizing them). I went to the North Paddington Foodbank, located in a community center in an immigrant-rich London neighborhood. It ran in a very similar fashion to a TT food bank, providing bags of canned food donated by individuals, and requiring a voucher. What impressed me however was the attention that the director of the food bank, Tara Osman, provided to as many of the 60+ recipients that came in the door within a two-hour period as possible. She sat down with each of them to understand their situation and provided them with guidance on how to navigate their problems. In addition, a debt counselor was on location to provide financial counseling to the clients.